1. One-touch brush: The built-in natural brush enables convenient use anywhere, anytime. 2. 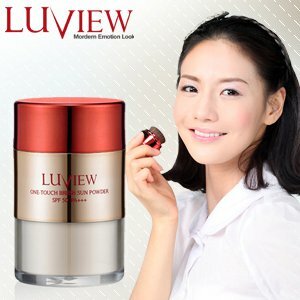 LUVIEW's sebum control powder. Loose, lightweight texture is right for every type of skin and skin friendly pigments keeps make up clean all day. 3. Ultra fine sun powder enables its use at the last stage of make up and skin-hugging formula delivers a reliably flawless finish. 4. SPF50+ / PA+++: KFDA certified. How to use : At the sun cream stage or makeup finish stage, the brush in the container is used to apply. It is applied from time to time under the maintenance condition. i need close the cap tightly and reverse the sun powder bottle then can get this effect as above picture. And i have to repeat same action few times to finish application on my whole face. -- the only point i dun love much is the application step abit troublesome , need repeat few time close cap tightly and reverse bottle . --abit pricey, however i think 9g powder can lasting for at least few month or above .